Google posted some impressive financial numbers today for the third quarter of 2010. Google earned $7.29 billion for the third quarter, which is up a whopping 23% year-over-year, and posted a net income of $2.17 billion. Google also reported having $33.4 billion in cash… now that’s a lot of cash! 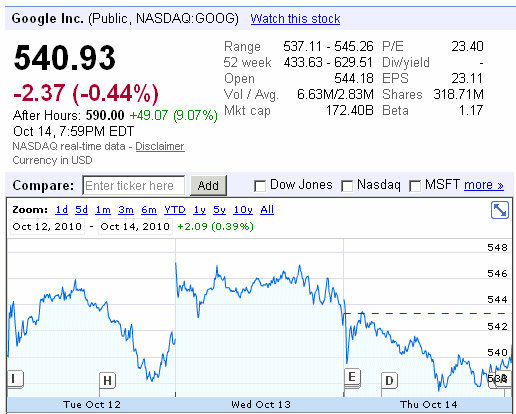 Currently, Google shares (NASDAQ:GOOG) are up over 9% in after hours trading. The stock price closed down today -2.37 (-0.44%) at 540.93. In related news, Facebook announced a partnership with Microsoft to bring “Instant Personalization” to Bing search results. This is basically adding Facebook Connect API to Bing search so that you can see what your friends have searched, and what content they are interacted with on Bing. The problem for Google is that Facebook probably won’t be interested in working with them to provide the same social features. That is, unless Google is willing pay a substantial royalty for the content integration. So I see this move as Bing, finally, gaining some sort of strategic advantage over Google, even though it might not last long.